Offering engaging, honest and thought-provoking stories that give readers a backstage look into the early lives of Jon and Tim Foreman of the multi-platinum, GRAMMY Award-winning band Switchfoot, parents Mark and Jan Foreman focus on challenging readers to rethink how they live out the primary purpose of parenting in Never Say No: Raising Big Picture Kids. This engaging book releasing May 2015 from David C Cook takes an inside look at an ordinary family that raised two sons who rock the world-literally! Mark and Jan Foreman are often asked: "How did you raise your kids?" Never Say No is the story of that process, but before the writing began, the question prompted the Foremans to consider what is a parent's purpose in life. Sharing their discovery, the couple reveal, "Our purpose as parents is identical to our child's: to live creatively beyond ourselves, bringing the love, beauty and nature of God to this world. As parents encourage kids to explore God's massive creative plan, they raise the ceiling on how their children can positively impact this world. Let the adventure begin." Just as Switchfoot appeals to a wide spectrum of music fans, this book is inclusive in its writing approach, allowing people from all backgrounds to enjoy the insights. The straight forward, entertaining style in which Never Say No has been written will allow both parents and Switchfoot fans alike to examine their own narratives. Both will be encouraged to reflect on the process of spiritual maturation and creative involvement in culture. In Never Say No, the Foremans explore practical parenting concerns, such as how to encourage holistic learning while cultivating specific gifts, how to nurture creativity in a media-saturated culture, how to balance structure with individual choice and why mistakes are always allowed. The couple also candidly shares personal, real-life experiences in the book. Finding grace amidst early mistakes, Mark and Jan recount one horrifying experience where two-year-old Jon nearly drowned. Rescued by his father, the Foreman sons have gone on to influence their world, not only by a successful music career, but also through their positive impact on communities around the globe. The brothers' parents instilled in them a belief that they could make a difference by living beyond themselves. "In my life, my parents have been equally counselors, companions, navigators, coconspirators and friends," says Tim. "They've been a source of wisdom not only for me, but also for our entire extended community. I'm excited that the simple parenting truths they've learned can reach even further through this book." "When I was young, I remember thinking that I had great parents, but didn't really know what that meant," adds Jon. "The memories return like a blurry ride. On the day my daughter was born, my wife and I began a different blurry journey-one where the stakes are high, sleep runs low, and time is of the essence. This book has given me a road map to see the past from my parents' perspective. And for new parents like myself, it offers landmarks of guidance to help map out the foreign terrain of parenting." Endorsed by Andi Ashworth, Charlie Peacock, Gabe Lyons, Rebecca St. James, John Sowers, Jamie Tworkowski, Patrick Dodd, Brad Lomenick and more, Never Say No has also been featured by Donald Miller. The Foremans were Miller's special guests for a parenting series available as an online course at https://meaningfulrelationships.co/parenting. 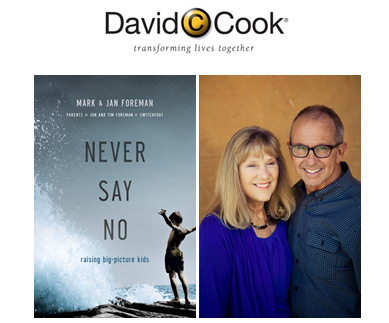 Written in part to encourage parents as they guide their children to live out God's purpose in radical ways, churches and small groups are encouraged to read Never Say No together. At the end of each chapter in the book are discussion questions that invite individual and group participation. Jan and Mark Foreman live in the San Diego area, where Mark is lead pastor of the 4,000 member North Coast Calvary Chapel in Carlsbad, CA. Mark is the author of Wholly Jesus, and holds advanced degrees in Theology, Education and a Ph.D. in Counseling and Pastoral Care. Jan is a gifted teacher and artist, and also facilitates partnerships with underprivileged women and children both locally and in developing countries. Together they love surfing, sailing, travel and especially being with their family.